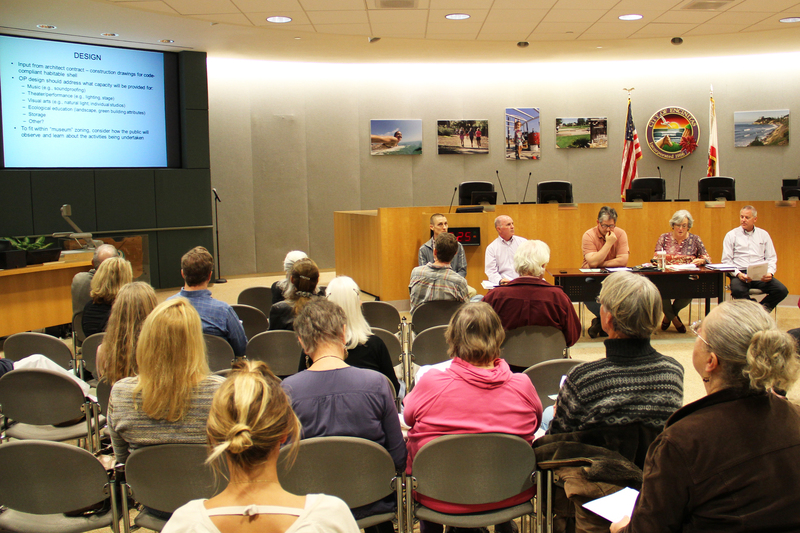 The last Pacific View Activation Subcommittee meeting was held at Encinitas City Hall on Tuesday, March 3. Addressing the audience of about 35 were (top, l. to r.) Senior Planner Kerry Kusiak, Senior Civil Engineer Ed Deane, City Councilmembers and Activation Subcommittee members Tony Kranz and Lisa Shaffer, and Director of Public Works Glenn Pruim. Interim City Manager Larry Watt, Arts Administrator Jim Gilliam and former Mayor Teresa Barth were also in attendance. The Pacific View Activation Subcommittee will hold its fourth public meeting at City Hall on Monday, June 29 from 11:00 a.m. to 12:30 p.m. to discuss progress on Westberg+White’s preliminary architectural design report and the solicitation for an operating partner. The subcommittee, consisting of Council Members Tony Kranz and Lisa Shaffer, will also hear public comments. Since the last subcommittee meeting. a series of Pacific View walkthroughs has been held for the public and potential operating partners, so it’s likely that there will be developments on that front. Public subcommittee meetings are less formal than City Council meetings and discussions often result in several ideas and concepts that will influence the final direction the city takes on the future of the Pacific View property. The City Council makes the final decisions, but the subcommittee can influence the outcome by presenting its reports and recommendations to the council.